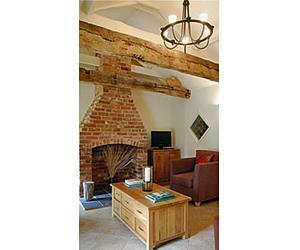 The Old Smithy01728 638962work Self-cateringThe Old Smithy at Manor Farm has two lovingly converted holiday cottages for your choosing - Romulus (sleeps 2) and Remus (sleeps 4) - both are furnished to a very high standard. The cottages have stunning views across open fields, countryside, the village church, with occasional chickens wandering by, and are ideally placed for visiting Norfolk and Suffolk's attractions. Both Romulus and Remus have been furnished to a high standard, and have wireless broadband access. Romulus has a large open-plan living/dining/kitchen area with all modern facilities. The bedroom is large and airy with accompanying en-suite. Remus has a cosy living room, two bedrooms with en-suite bath or shower rooms and a kitchen diner. A wood burner is also available. All the rooms have tiled floors and under floor heating. Outside there's a large patio area with garden furniture and uninterrupted views across open countryside. There are footpaths close by for you to explore and a pub with real ales within a 10 minute walk. There are many local attractions in the area, including Thetford Forest which is ideal for walking and cycling (if you're feeling more adventurous try the 'Go Ape' high wire experience at High Lodge where you'll be fitted with a harness before tackling rope bridges, and zip slides high above the forest floor!). Then there's Banham Zoo and Grimes Graves, a 5,000 year old flint mine where visitors can descend 30 feet by ladder to explore one of the excavated shafts. Further afield there's Oxburgh Hall, a beautiful 15th century moated house owned by the National Trust, with secret doors and a priest hole; and then there's Norwich with its beautiful cathedral, historic buildings and independent shops. The Old Smithy at Manor Farm has two lovingly converted holiday cottages for your choosing - Romulus (sleeps 2) and Remus (sleeps 4) - both are furnished to a very high standard.